Turkish Delight smelling Hand Cream. Go for it! My initial thought was the packaging looks nice and lady like, it's very much Melvita's style. I love the flip top as it is so much easier to use than a screw top, how hard is it to reapply a screw top when your hands have had cream rubbed into them. The smell is a bit like Turkish Delight which I like, it's not over powering which is definitely a good thing. It absorbs well however leaves a little bit of a shine and oil; not too much to make it a bad product though. You do not need to use a lot so the value for money is good, a little goes a long way. I would definitely recommend this as it is a lovely scented hand cream that leaves the hands feeling nourished. Leaves a LITTLE bit of shine and oil. Lovely, pretty packaging which just screams Melvita! 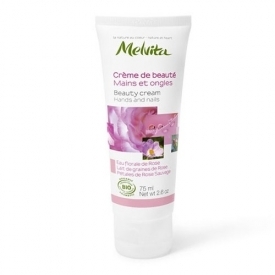 A rose scented hand cream that leaves the skin soft and nourished.